Conker Comets is a game that, when I was small, I was convinced my siblings and I had invented. 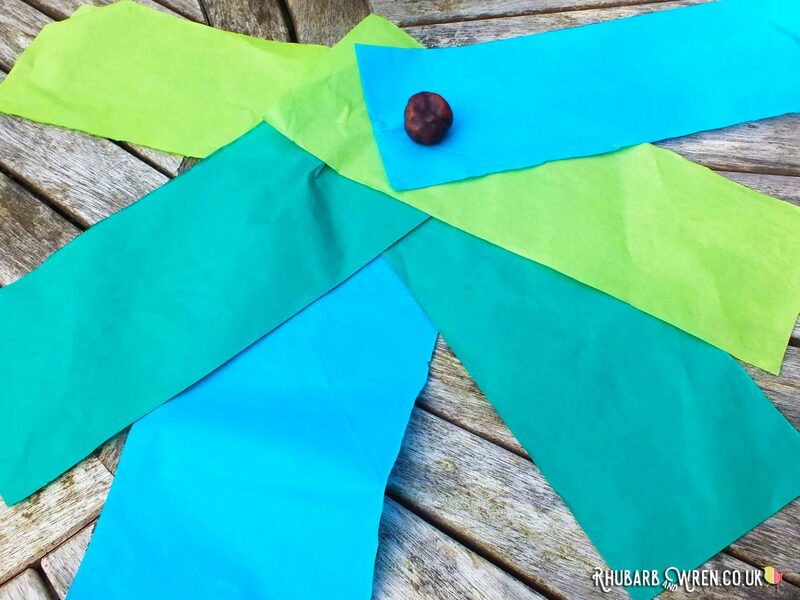 We would wrap a conker in the centre of a rectangle of tissue paper or some crepe paper streamers, tying it tightly so that the paper formed a long tail. Then we’d take turns seeing how far we could throw it (alas, young hooligans that we were, it is possible that we may have used each other as target practice…). 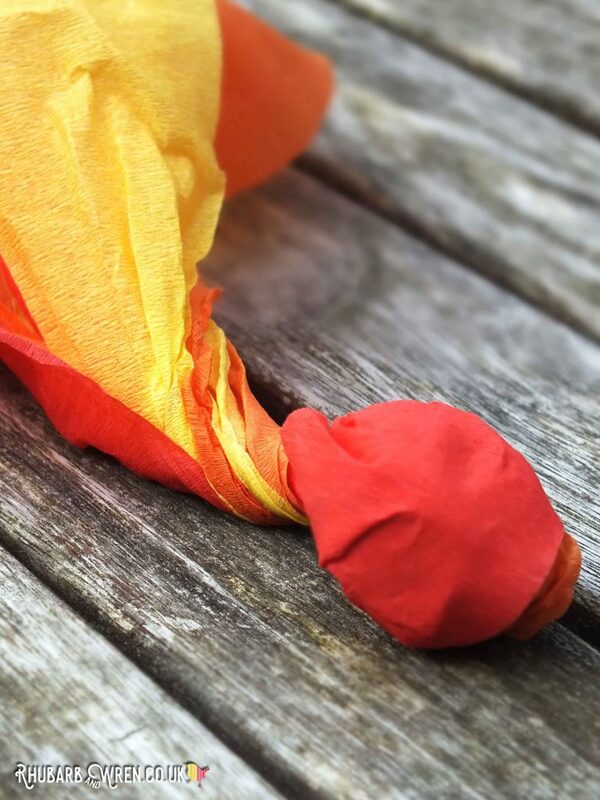 A childhood classic – making conker comets to throw for a fun autumn game! 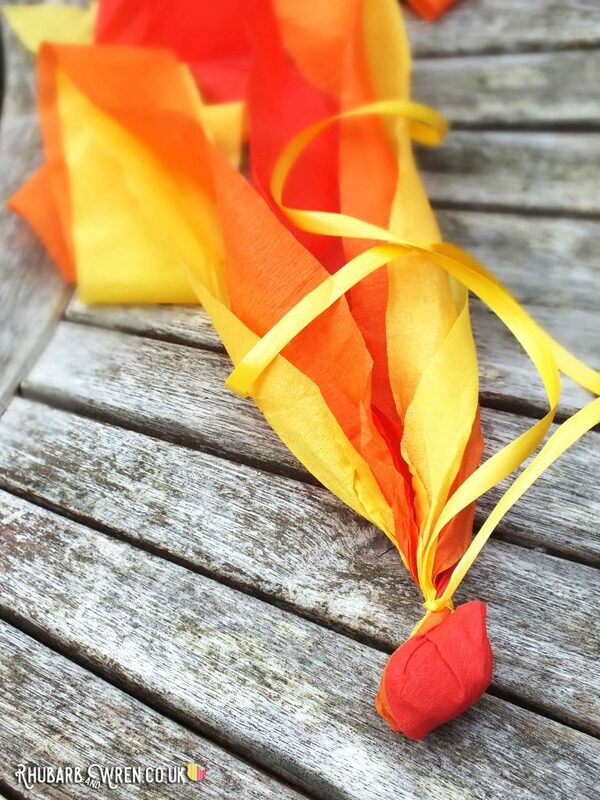 This craft activity is a perfect way to use up autumn conkers that are past their best. 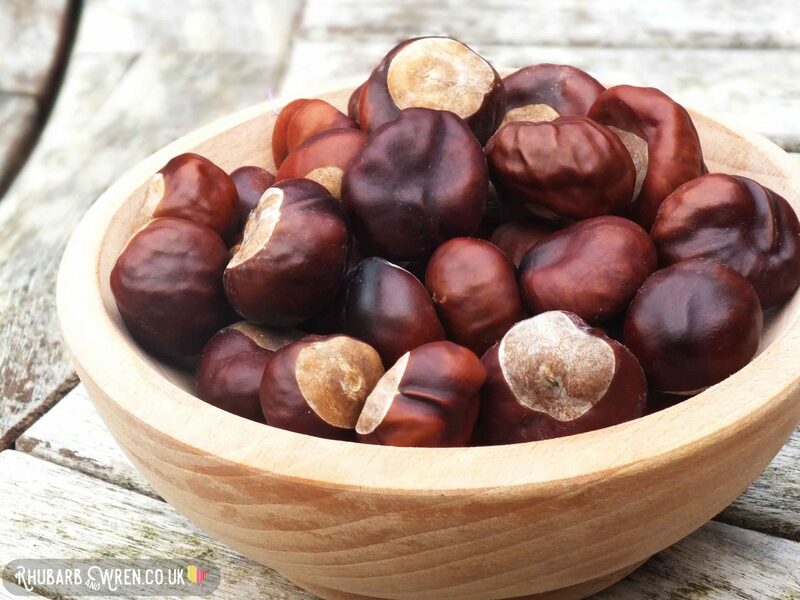 However, by now even our best conkers are now looking past their prime, so while we tried the other method just to see how it worked, this year we mostly stuck to our tried and tested way of doing things. 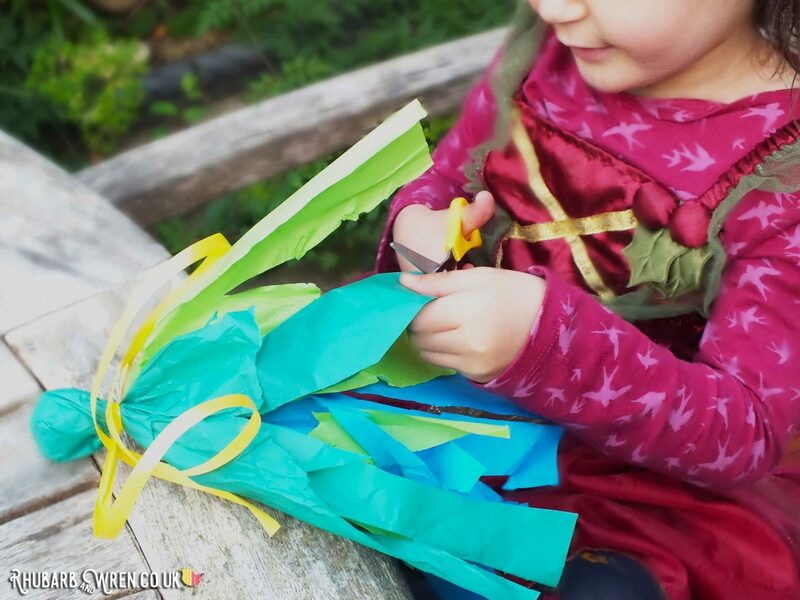 The benefits of this method are that it is REALLY easy – even very young kids can have a go at wrapping their paper around the conker and tying it with an elastic band or bit of ribbon, and they get to practice both fine motor and scissor skills during the ‘making’ as well. 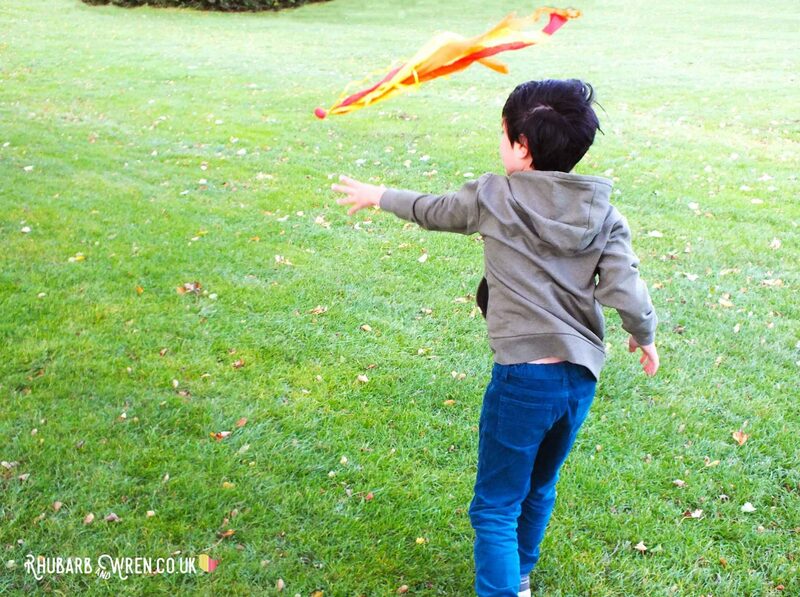 The finished comet is also easy to throw and very secure – there’s practically (never say never) no danger of it coming apart during play. Blues, purples, white and silver make for an icy comet! 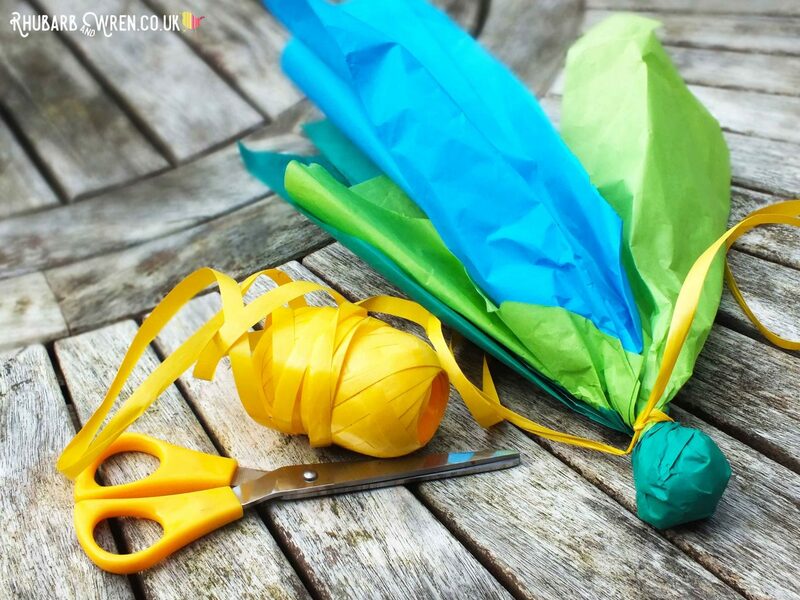 You’ll need conkers, tissue paper or crepe streamers, and some ribbon to make these conker comets. 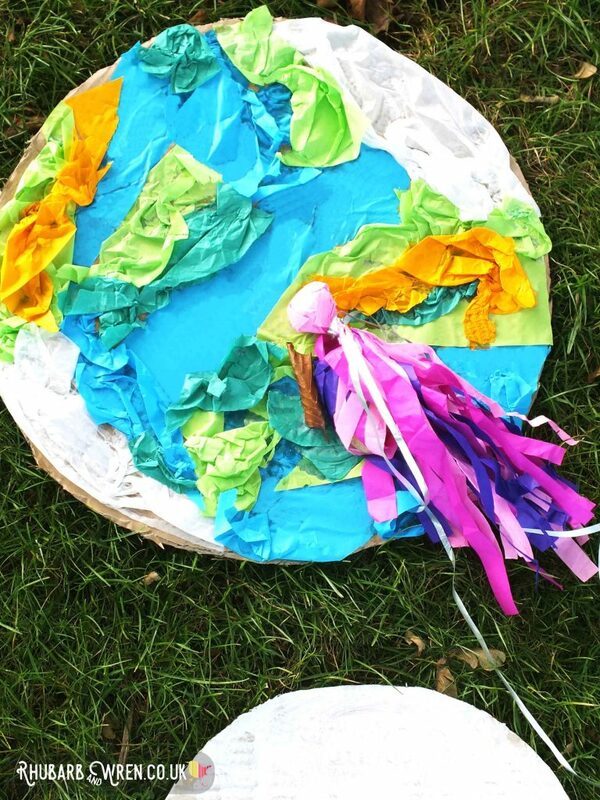 Cut some long and narrow rectangles of crepe paper, tissue paper or cellophane (pretty!) 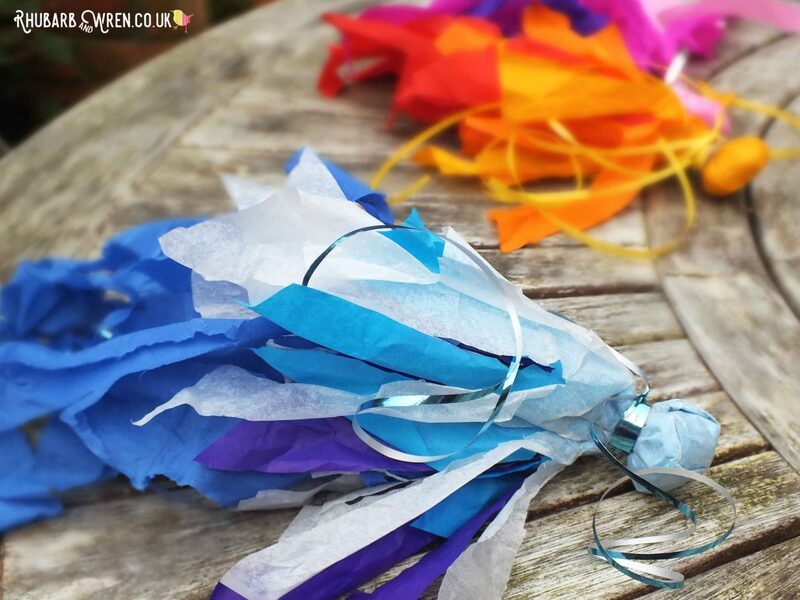 – or alternately cut some lengths of crepe paper streamers. Twist the paper to hold in place before tying. Fasten with a band or ribbon to secure. 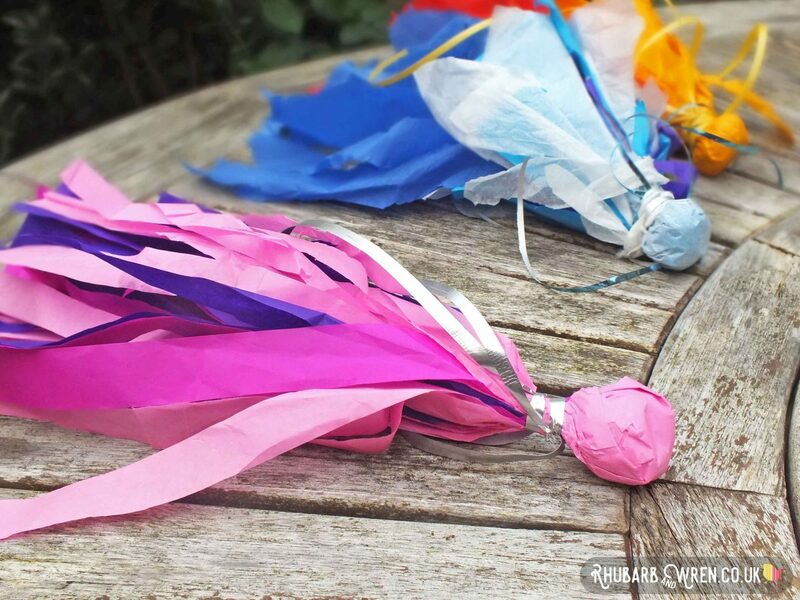 If using crepe streamers, you can make the tails any length you like – long tails look spectacular flying through the air. Whereas using smaller A4 or letter-size sheets makes for a slightly weightier comet that is easier for very young ones to throw (and these short-tails still look really cool!). 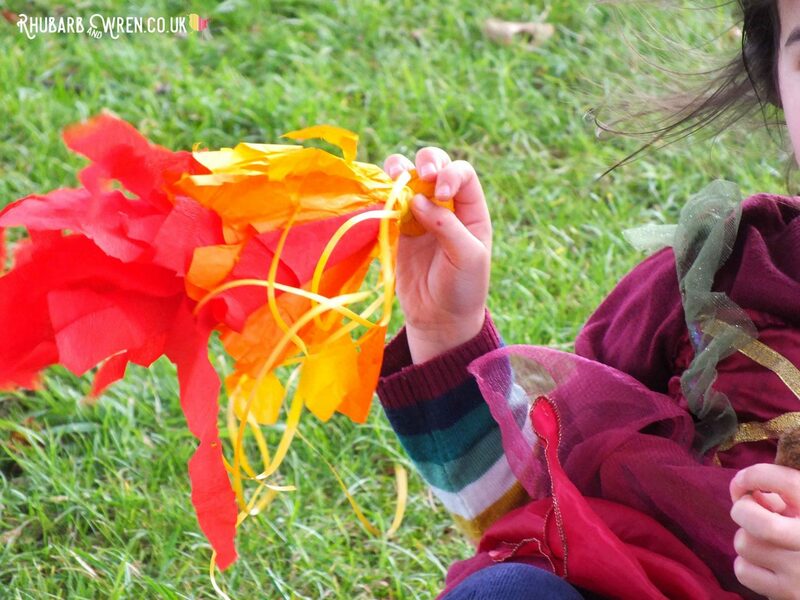 Use curling ribbon or strands of wool to fasten your comets, to add an extra bit of colour and fun! 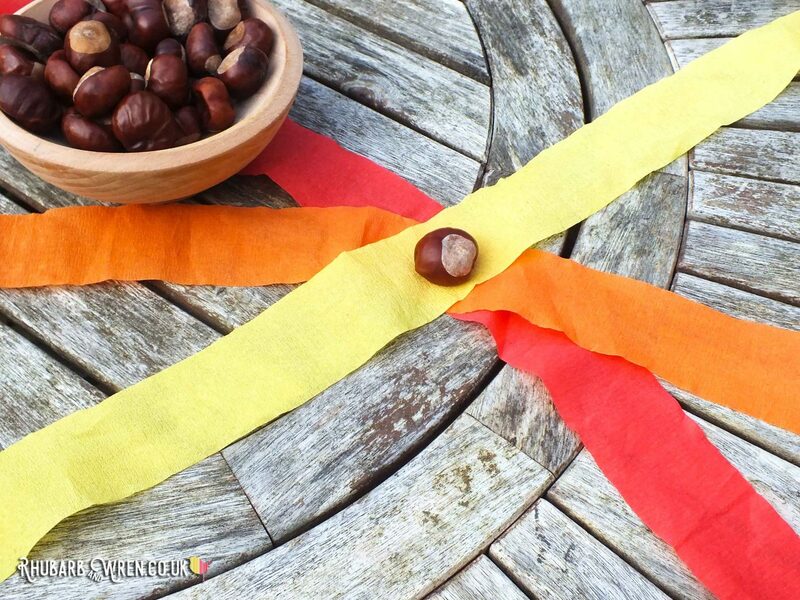 Put your conker in the centre of the star, and gather the paper tightly around it, giving the tail a twist to hold the conker in place. Secure with an elastic band, string, ribbon or bit of wool under the conker, so that it’s securely contained, with a long paper tail. Snipping the tail of their conker comets is great scissor skill practice. Shred the tail into thinner strands. You can layer a couple of different coloured sheets to get a multicoloured tail, and you can tie ribbons (curling ribbons are perfect) onto it as well, for added streamer-y-ness. 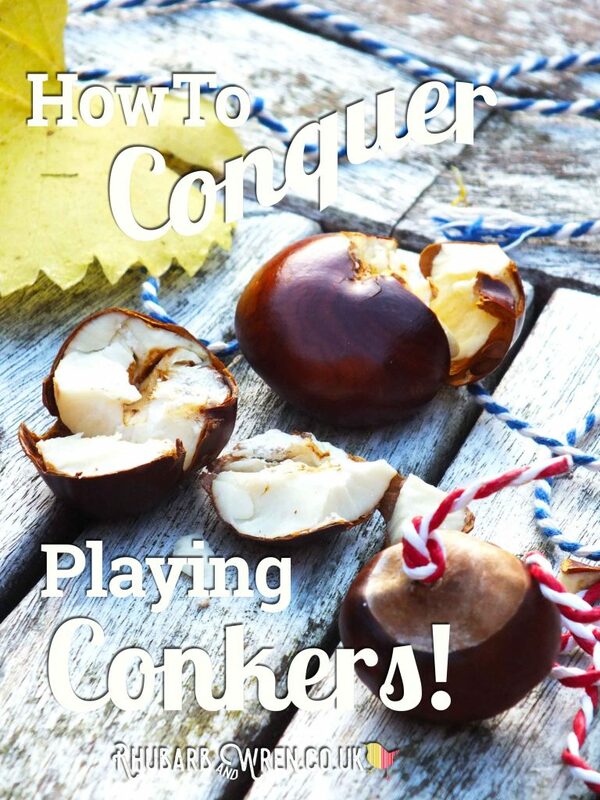 Older children may want to shred their paper BEFORE wrapping the conker in it, as that way is easier to get even strips. Younger children will probably have more fun just snipping away at the tied tail. I quite like the uneven and more organic look you get that way, but we made some both ways to show the difference. The tail on this pink and purple comet was cut into strips before being wrapped around the conker. Take your Wrapped Rocket conker comet outside – somewhere with a long, clear stretch – and chuck it as far and high as you can*. Watch it fly! Long streamer tails look so cool when flying through the air! For an alternate way of making these, what follows is the version I found on the brilliant Red Ted Art and Labbe blogs, so do check out their instructions, which are full of great ideas. 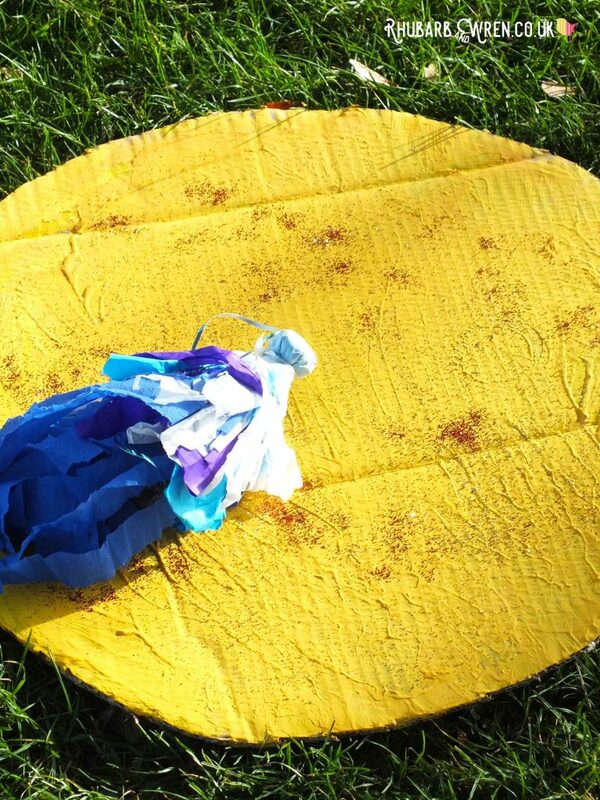 However, for the sake of completeness, this is our interpretation of their alternative way to make conker comets. 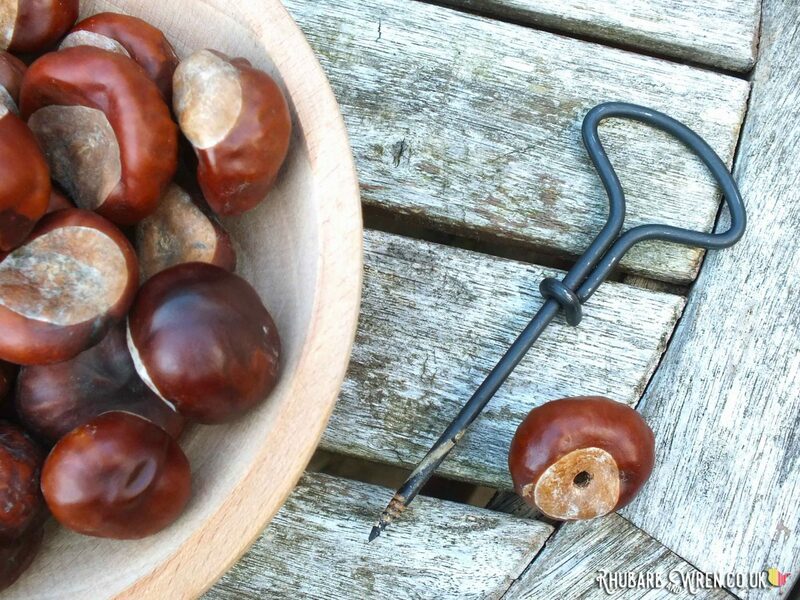 Make a hole in your conker (these fabulous tools make it much easier and safer for kids to do). 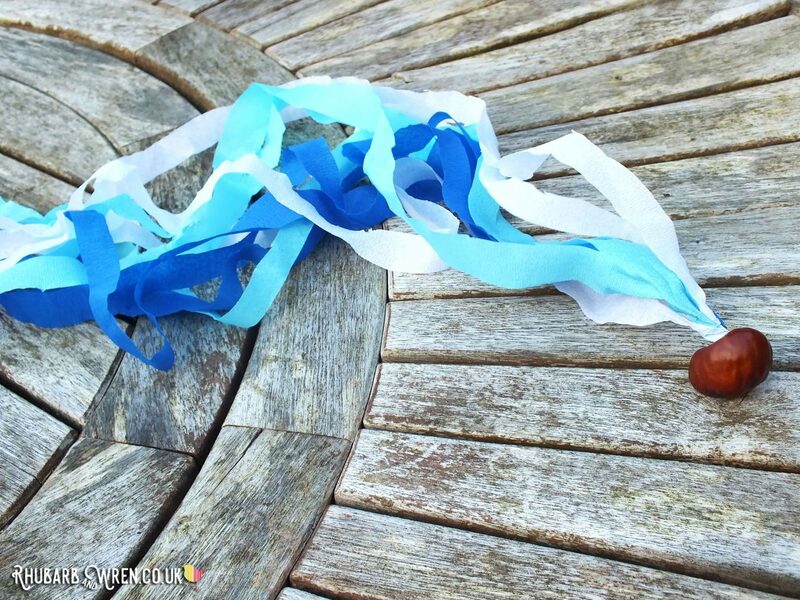 Make a long ‘tail’ of paper strips or ribbons, and twist the end tightly. Insert your tail into the conker – we found that the fit was usually tight enough to hold it securely, but you could use a bit of glue in the hole if necessary. 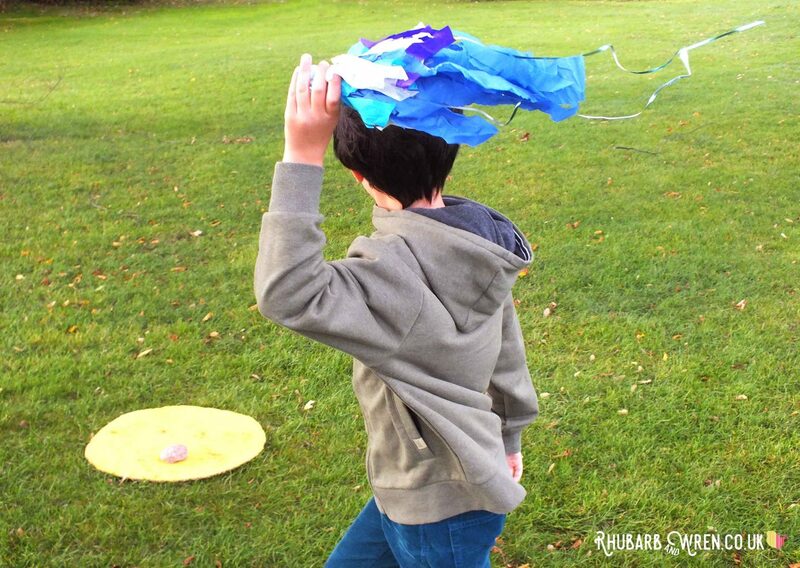 Holey Hurlers are just as simple to make as our wrapped up conker comets. Having a target to aim at adds even more fun to our conker comet games! *Please ensure your throwing space is clear of people and animals – nobody wants to be hit in the head (or anywhere else) by a conker comet! We found shouting ‘Comets Away!’ as we threw them cleared the area pretty fast. Sometimes just running with your comet is as much fun as throwing it! And as for which comet turned out best? 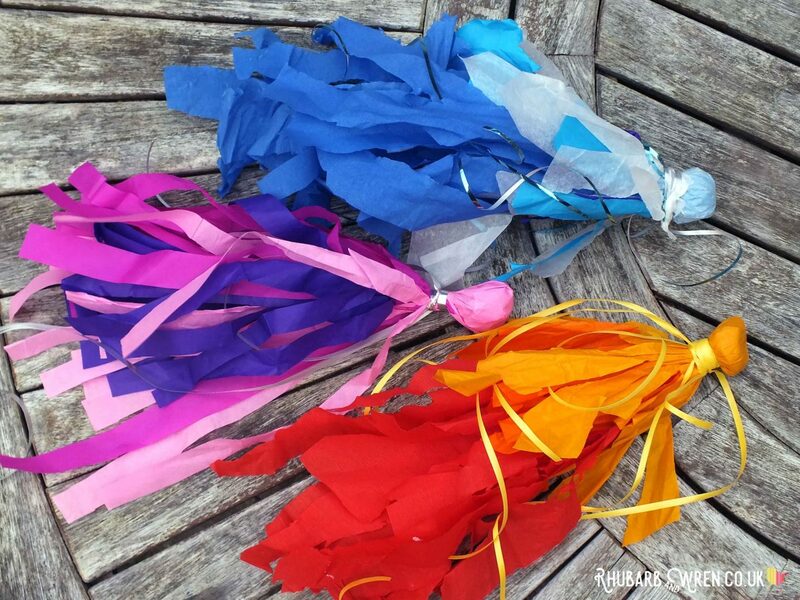 Wrapped or Holey, the long tails of the streamer-made comets looked spectacular, but were more difficult to throw if there was any wind about, whereas the shorter-tailed comets made with A4/Letter sized tissue paper were excellent fliers in any weather. We did have a few Holey Hurlers lose their tails (none of the wrapped versions came apart) – but it was extremely windy on our test day. Ultimately, the kids decided that the results were inconclusive and so they will have to carry out much more testing before they can make the call. Which makes the whole thing a win in my book! 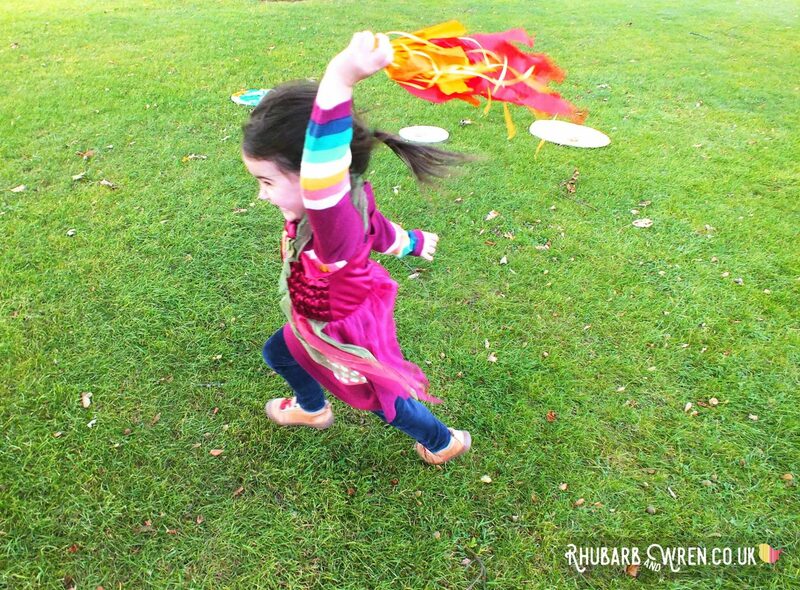 Colourful conker comets soar through the air when thrown. 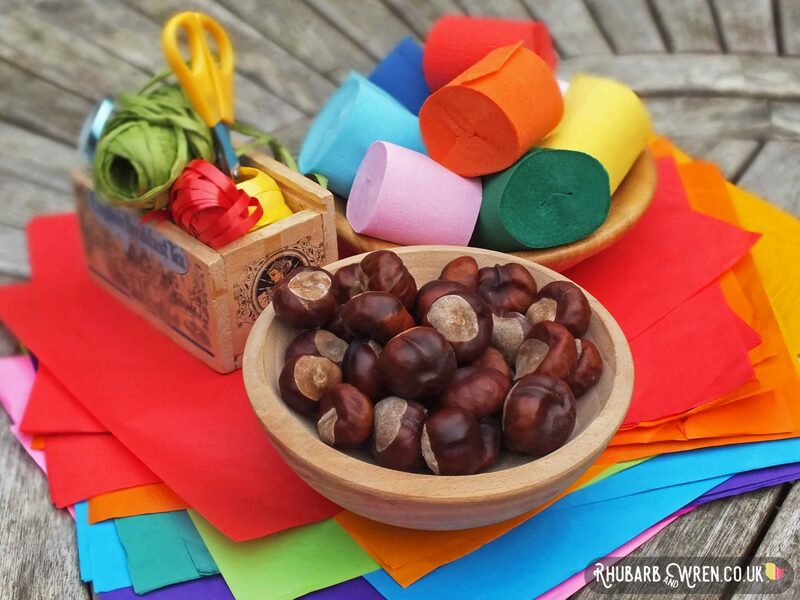 Autumn, Conkers, Craft, Nature, STEAM. Bookmark. Believe it or not, my kids love raking the leaves on our backyard whenever autumn comes rushing in. Not for the sake of having a clean playground, but to play and scatter the leaves all over again. They’d spend hours and hours outside playing so I thought I’d give them something new to try while I rake the leaves and (finally) have a clean backyard. 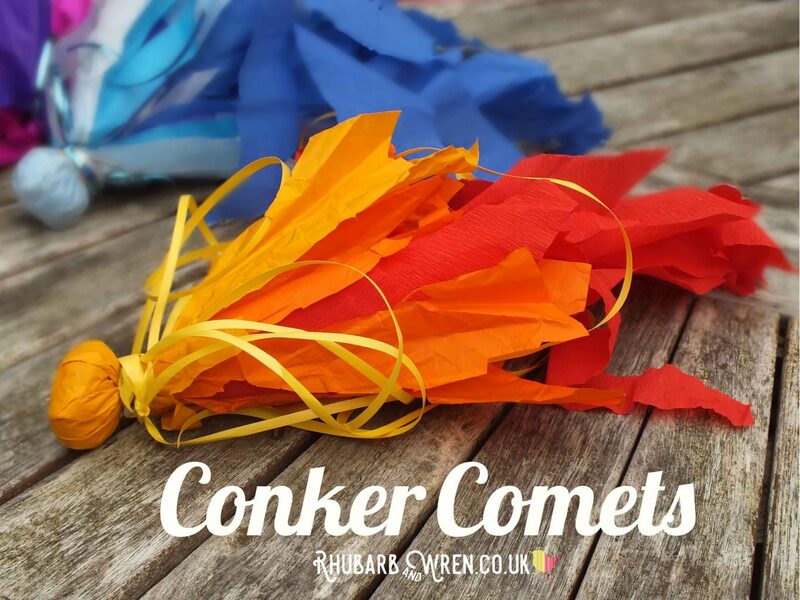 They’ll love making these conker comets, and? I’ll finally be able to get rid of the pruney chestnuts. Hope she enjoys, Emma – let us know how she gets on! These look fabulous! I really want to try them with my boys! They are super-duper easy – I’m sure they’ll love them!